Trump loves his new chief of staff’s blunt and aggressive style. That could be a problem. The Homeland Security chief’s aggression and blunt style endeared him to his boss. But a White House chief of staff needs a smoother approach. 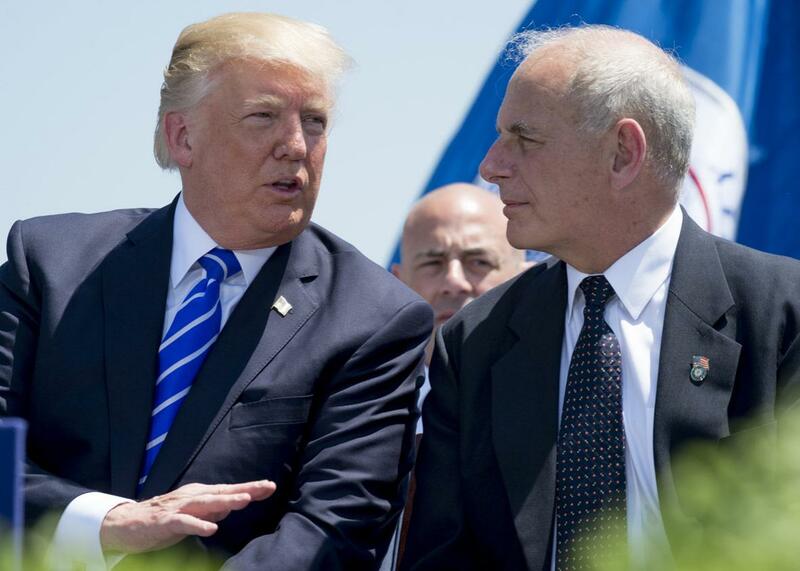 President Donald Trump speaks witih Secretary of Homeland Security John Kelly at the U.S. Coast Guard Academy’s commencement in New London, Connecticut, on May 17. If President Donald Trump called the “central casting” office that he often invokes to send over the archetypical military man to knock sense into his team as chief of staff, it would likely dispatch John F. Kelly to the White House. In 42 years of active service as a U.S. Marine, Kelly worked his way up from enlisted grunt to four-star general, serving in both Iraq wars and a number of other deployments. He’s also endured incalculable loss with the combat death of his son Robert in 2010. Kelly’s career culminated as the commander of Southern Command, responsible for all U.S. military operations in South and Central America. Trump has a thing for generals, and it’s not surprising that he gravitates toward Kelly in particular. While serving under President Obama, Kelly became an outspoken advocate for greater efforts to secure the southern U.S. border. Kelly also has a bombastic style that is exactly what you would expect of a four-star Marine general raised in a Boston-Irish family. Kelly has also fallen victim to criticism over plans to build Trump’s vaunted wall on the U.S.-Mexico border, which appear to be stuck somewhere in the federal budgeting and procurement process. And Kelly has taken much of the criticism—from both Democrats and Republicans— for immigration policy and enforcement actions that are either too tough or too lenient, depending on the critic. However, Kelly hasn’t responded constructively to that criticism, picking fights with Congress when he ought to be building bridges (or walls, as the case may be). The big open question for Kelly now is whether he can impose order on an unruly, undisciplined, and shell-shocked White House team. Kelly need only read the terrific palace intrigue dispatches by Maggie Haberman and her New York Times colleagues to see just how bad Reince Priebus has run the White House staff aground. Set aside any substantive policy issues: The Trump White House simply didn’t run as a White House must run on a day-to-day basis. Any president, no matter his political stripes, should have fired his chief of staff in this situation. First, Kelly must persuade his boss to take it down a notch and focus on the job instead of creating spectacles and fighting with his enemies, real and imagined. Trump oscillates so fast between issues that his own staff cannot keep up, let alone the network of legislators, surrogates, and political supporters necessary to give momentum to a White House. This White House will remain stuck in neutral unless Kelly can convince Trump to settle down and let him navigate a steadier ship. Second, Kelly must bring order to a White House team that is at war with itself. Contrary to what Trump’s vulgar communications director, Anthony Scaramucci, may think, the Trump White House is leaking because no one trusts each other or much likes their bosses. On health care, immigration, foreign policy, trade, and so many other issues, the White House has devolved into hostile camps led by various chieftains like family advisers Jared Kushner and Ivanka Trump, chief strategist Stephen K. Bannon, National Security Adviser H.R. McMaster, and chief economic adviser Gary Cohn. These camps not only disagree on policy. They also dislike and distrust each other. Kelly must make these teams work well together or disband them and fire their leaders. Third, Kelly must discipline the president and the White House to function amid an increasingly toxic political environment that includes the special counsel’s investigation into the White House and Trump campaign, numerous congressional inquiries, and a hostile press corps. In a sense, the combat veteran must teach the White House staff to function as if they’re walking through a steady barrage of incoming mortar rounds. This is, of course, easier said than done. But if the White House cannot learn to walk and chew gum simultaneously, it will be paralyzed by l’affaire Russe and the myriad other scandals emerging from the White House. Fourth, Kelly must reinvent himself to succeed. His bluster and bluntness served him well as a Marine; he could afford to make enemies more easily when given political cover by the secretary of defense and chairman of the Joint Chiefs. Kelly’s aggression in his former job succeeded because it played so well internally and was consistent with what many expected of a law enforcement chief. This bluster is undoubtedly why Trump hired Kelly and brought him over to the White House. But to succeed—and to make Trump succeed—Kelly must now shed this skin and become a smoother political operator.